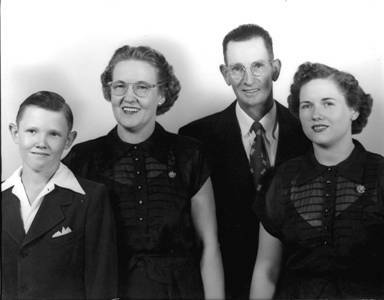 In October 1943 we three Niebaums moved to a house on Main Street in Corbin, Kansas. Our address was Box 7, Corbin, Kansas and it remained so for about 17 years. In Corbin you either lived on Main Street or you didn't. The other streets did have names, but no one knew them or used them. In fact almost no one used the name, "Main Street". You either lived in Corbin or you didn't. Not a single house had a street number, but all of the houses had family names. The Cadwalader house and the Greenman house retained their names until long after residents by those names had departed. We moved into the Hess house. Joann continued to live in Caldwell to go to high school there, because gasoline and tires were rationed due to the war. Corbin was a very special time and a very special place in my life. I smile each time I think about Corbin. In 2001, my cousin, LaRue Watts, gave me the postcard from which the above picture is taken. It had belonged to his mother, Finace, my aunt. The two-story building at left center was Corbin Grocery. The two-story building at right was a hotel on the site of what became Corbin Garage, my dad’s auto repair business. The sign on the Post Office reads: Corbin Post Office, Sumner Co. Kansas. Corbin school had been a combined grade school and a high school earlier, but by the 40's it had only 8 grades in 2 rooms with 2 teachers. The school was a large 2-story brick building built in 1909 and stood at the southwest corner of town. Corbin was 7 blocks long and 3 blocks wide. It had a population something less than a hundred, but in 1943 it had a bank, (Corbin State Bank), a hardware/lumberyard, a grocery store, a post office, a bowling alley, a cafe (Corbin Cafe), a telephone office, an oil company (Corbin Oil), a service station, a blacksmith shop, two grain elevators, and a train depot. The main line of the Rock Island railroad ran thru the edge of town. The hotel had burned long before, and the bandstand, where Saturday night brass band concerts were held, had been torn down. Dad recalled that the hotel had done a thriving business in earlier times. Dad said a fellow from Switzerland stayed at the hotel and mornings would step to the balcony and yodel for all in town to hear. 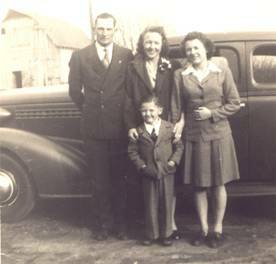 Dad and Francis Conrady opened a garage for auto repair on the site of the old hotel. They were partners for several years. Dad worked really hard and long hours to make the business successful. By 1943 the Corbin Methodist Church was the center of social activity for the Corbin community, with some competition by the duckpin bowling alley. I never did know why they called them "duck pins". They were merely wooden pins in the shape of the current bowling pins. The balls, however, were smaller and had no holes for the fingers. Dad enjoyed bowling and I think he was pretty good at it. There were no automatic pinsetters in the Corbin bowling alley, so it provided a pretty good source of pocket change for those of us willing to set pins for 10 cents a game. We pinsetters each had a loft to set on as each ball was bowled. I remember it being very loud and scary. For a while in earlier years the Corbin Methodist Church had competed with the Methodist Episcopal - South church that had long since been torn down by 1943. The Perth community 5 miles north of Corbin had a Baptist church, which drew some of the Corbin faithful. But, for the most part, if you were Christian and lived in Corbin, you were a Methodist. Mom and I were Methodists. The Hess house had no indoor plumbing of any kind. We didn't stay there long and moved to another 'Hess' house 3 blocks away. It had no indoor plumbing either. The flush stools and water faucets from Beechwood seemed like a past luxury on those cold runs to the outhouse. I do have memories from our short time in that house, because we spent 1943 Christmas there. Joann was dating a handsome young fellow named Kenneth Nulik, who gave her an Evening in Paris gift set of cologne, perfume, powder, and who knows what. The dark blue boxes had stars on them, and we all agreed what a fine gift it had been. He must be serious! Also that Christmas I got a windup airplane that shot sparks as it raced across the floor. Christmas was always a very special time for us because Mom made it so. Often she would make gifts by sewing or crafts. We always had a Christmas tree with an abundance of decorations. For the 1943 Christmas I remember helping string popcorn for a tree decoration. Mom liked to cook, so we also had lots of good things to eat. We were poor, but I didn't know it. A few months later in 1944 Dad bought the Cox house and nearly one fourth of a 'city block' of Corbin. I'm sure it was a shared decision and joint responsibility, but the way it was always presented and in my memory, "Dad bought the Cox house". It was next door and across the alley, so the move wasn't far. The Cox house had no indoor plumbing of any kind, but the outhouse was in better shape. It had two adjoining seats to serve multiple visitors, a design I still can't quite understand. More important for me, our new home had a huge yard, big enough for a 'ball field' and it bordered on Main Street. It was only a one-story house but had a very high pointed roof, which made it seem bigger. It also had 3 bedrooms, living room, dining room and kitchen. Outside it had an enormous porch that covered two full sides of the house. There were entry doors on 3 sides. Two stoves, one coal and the other fuel oil, kept us warm in the winter. Mom cooked on a kerosene stove. The refrigerator was electric, but the freezer section was big enough for ice cubes only. Mom said that for some reason I liked the taste of coal, so she had a tough time keeping me out of the coal bucket. The Cox house was my home through all of grade school, high school, and some of my college years. Childhood was a very happy time for me! In fact there have been no times in my life, well almost none, when I have not been happy. I remember my Corbin years as carefree and fun. My cousins, Don and Barbara Niebaum moved in next door (the Hess house). My cousins Lagrant, Wynant, and LaRue Watts lived on the far south end of town. Playmate friend, Gary Richards lived down there, too. Norma, Patty, and the twins Marilyn & Carolyn Wilson lived only 3 blocks away. Their older sister, Gloria, was not a playmate, but was a friend later. She painted the picture of the Corbin school, which hangs in our living room. Their younger brother, Billy Wilson, had not been born yet. Lee Nelson had a big old house off Main and second cousin, Raymond Pope, lived on the north edge of town. Grandmother Smith's maiden name was Pope. Mom and Raymond's dad were first cousins. Barbara Niebaum and Patty Wilson gave me the first kisses I remember. In an old barn at the 2nd Hess house we once played 'bride and groom'. I was the groom and the two girls took turns being the bride kissing the groom. Patty was a year older and probably it was her idea. I was 5 and quite the ladies boy. Though I don't remember the kissing part very well, I can still picture very clearly where we were in the northwest corner of that barn, near the door that faced the west. Barbara, cousin LaRue, and I were constant playmates at that time. 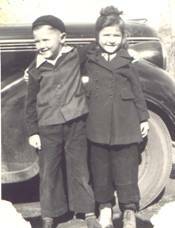 Barbara moved to Oklahoma at age 7, and shortly thereafter contracted rheumatic fever and died. Mom kept explaining to me how very sick she was during her illness. It was devastating to all of the family. Granddad Niebaum had died a couple of years earlier of prostate cancer at age 75, so this was my second experience with death. This was very different though, because she was one of my own age, and it was clear that this could happen to me, too. It seems to me that throughout their lives Dad's brother, Lynn, and his wife, Lucille, never did really fully recover from her death. I don't remember attending the funeral, but I do remember missing her a lot. Later in 1946 another tragedy struck our family. My 17-year-old cousin, Wynant Watts, stepped in front of a speeding car outside the Ritz Theater in Caldwell. He had just come out of the movie. He died a few hours later in Caldwell Hospital. His mother, Finace, and Mom were very close sisters. I think Mom was quite a lot of comfort to help her through that time. 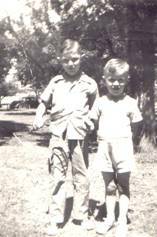 By then Wynant's younger brother, LaRue, and I were more like brothers than cousins. It was a pretty tough time for him, too. My baby book has my very first one-year birthday card from my cousin, Wynant! LaRue's older brother, Lagrant, could easily have met with tragedy as well. Uncle Ralph Watts owned and operated Corbin Oil Company at that time. There were gasoline storage tanks in downtown Corbin and north of town near the depot. The gasoline truck was stored in a garage at the north site. One afternoon it caught fire. I remember smelling and seeing the smoke, which hung thick, black, and heavy over town. My friend, Barbara Schlottog, and I ran to Main Street and could see the flames as well. Lagrant was one of the first to the fire, and ran into the garage and saved the gasoline truck by backing it out through the fire. He singed all the hair off his arms, but had no lasting burns. It was the only fire I ever remember in Corbin. 1945 was an eventful and memorable year, because I made my first record and also started to school. 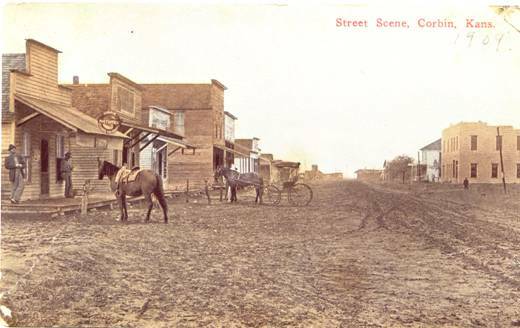 My cousin, Rua (pronounced 'rooee') Choice and his wife, Marvis, lived in El Reno, Oklahoma. Rua was a real enthusiast for electronics. He had his own equipment to make phonograph records. Later, in 1948 or 1949 he built his own television set. Also one year, his son, Donald Joe, became the youngest kid in the country to have his own ham radio license. The Choice family was probably responsible for stirring my budding interest in electronics. When we visited the Choice family on June 24, 1945, Mom and I made our recording debut. We rehearsed briefly, and then made a double sided recording with no second takes. I sang solo, Mom played piano, and cousin Rua played guitar. The 78 rpm record is still playable after 50 years, though very scratchy by now. Side one is 'Don't Fence Me In' and side two is 'Accentuate the Positive'. 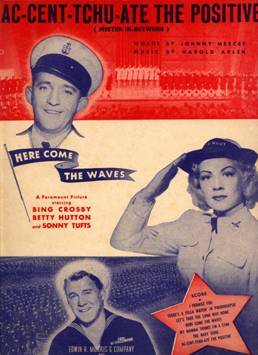 Both songs were popular in the 40's. I remember the recording session, but mostly I remember that Donald Joe had his own electric train set, which I got to operate - my first ever. An electric train often has a unique smell. I remember the smell of that first train. Accentuate the Positive has been sort of a credo of mine, so I'll share the lyrics, as I remember them. And latch on to the affirmative. Don't mess with Mr. In Between. Is liable to walk upon the scene. Just when everything seemed so dark? These were pretty big words and lofty concepts for a small town 5 year old in 1945. I had no idea what they meant! 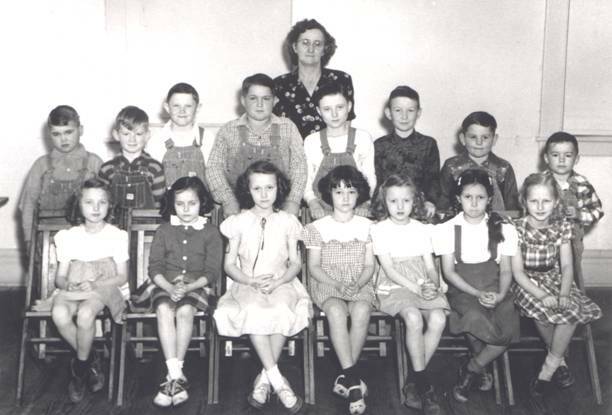 In the fall of '45 I started to first grade and my teacher was Miss Williams. It was her first and only year to teach. She was only about 20 with just enough college to get her teaching certificate, but I remember her as being an excellent and beautiful teacher. The following summer she married Bob Rice and never taught again. There were only about 4 or 5 of us in first grade that year. Those I remember were Geraldine Hess, Herbert Lacey, Wayne Johnson, and I. Roger Whitten joined us in second grade. Ours was the 'South' room, also called the 'little' room named for the size of the kids. There was a 'North' room, a.k.a the 'big' room. A single coal stove heated our room. The floors were oiled wood, that is to say they were wood with oil put on them to preserve and protect the wood. The net effect was that they were always dirty and would soil anything that touched them. One time I got angry at my math workbook and threw it to the floor and stomped on it. The oil made quite a mess of it. When Miss Williams checked my work she placed a big red question mark on that page. I can still remember that crumpled page with the red question mark in the middle. I really liked first grade. Second grade was very different. Ruby K. Martin was a tough disciplinarian. Once in second or third grade she grabbed me by the hair and nearly lifted me off the floor. You might assume that I was a problem student, but that was hardly the case. She was just plain tough! I think I learned a lot from her. Her companion teacher in the "big" room was even tougher. She used a rubber hose to whip kids into shape. We heard about Frankie Kern getting lashes on his leg and laughing in her face. Frankie was a tough kid and made a great fullback later in high school. Our school day was 9:00 a.m. to 4:00 p.m. with 15-minute morning and afternoon recesses. Lunch was 12:00 noon to 1:00 p.m. The school year started in September and finished by the third or fourth week of April. Ours was an "8 months" school. Roger Whitten joined our class in second grade. Frank and May Whitten moved from Perth to Corbin and operated the lumberyard and hardware store. They moved into the Hess house, where we had once lived. Roger and I quickly became best friends. He was bright and an excellent student. We provided intellectual challenges to each other throughout grade school. Recess activities were highlights of the school day. We had a teeter-totter, a slippery slide, and a merry-go-round. A grand swing set was added a little later. Frankie Kern was the first kid to take a swing "over the top", i.e. he stood on the swing and gained enough momentum to go all the way over. It's amazing we survived grade school. Games were dare base, tag, blind mans bluff, and in the winter, sledding. There was a great hill behind the school and I remember lots of snow time and sledding time. The edge of the school property had barbed wire because it was adjacent to a pasture. The pasture had a farm pond with lots of crawdads. We were not permitted to cross the fence, but once in second grade some friends and I ventured to the pond to catch crawdads. I came back a muddy mess and Mrs. Martin was not pleased. I don't remember anything but a scolding and standing near the stove to dry my clothes. The best recess activity for me was softball. I loved to play softball and continued to play regularly until well into my 40's! Corbin grade school had no indoor plumbing. Water for drinking and washing was carried from the pump outside. We shared a common drinking dipper. There were two outhouses, one for the boys and one for the girls. Later, the girl’s outhouse fell into disrepair and we shared a unisex facility. In June 1946 Joann and Kenneth eloped! Somehow Mom was not surprised. She knew they had been thinking about it for a while. I remember them driving into our alley and announcing their marriage. It was a happy, happy time for the family. Third grade brought some big changes! The school started a "hot lunch" program. For 25 cents I could have a hot lunch instead of a cold sandwich. I loved it! Our lunchroom was on second floor. Our cook, Mrs. Hess (no, not the Hess of "Hess" house), was a kind woman who seemed to love kids. She was also a great cook and let us have seconds or thirds or fourths. Her chicken & noodles were my favorite. She liked me and I liked her. I do remember one party from 3rd grade, a birthday party at Gloria Eckerman's house north of Corbin. We concluded the evening by creating a new game. The boys would chase the girls, tackle them, and kiss them. It seemed to me the girls sure ran slowly that evening. I'm not sure exactly when LaRue and I started attending Saturday matinee movies at the Ritz Theater in Caldwell. We went often enough that we got hooked on serials and rarely missed an episode. I remember being frequently frustrated at the hokie transition from one impossible situation to the following week when there were details shown that weren't there before. The Saturday matinees were mostly westerns. My heroes were Gene Autry and the Durango Kid (white horse, black mask), but I liked them all. We also watched a lot of Abbott & Costello, Ma & Pa Kettle, and the like. The first really scary movie I remember was "Anna & the King of Siam", the story later used as the basis for "The King and I". There was someone threatened with a poker heated in red-hot coals. LaRue and I had our favorite seats, 1 & 2, in the second row near the front. We tried to be first in line so that no one would get our seats. The Ritz Theater was really quite nice, ornately decorated, with comfortable seats. The chandeliers were shaped like giant Oreo cookies. Before the movie they would play music, which seemed to be the same every week. I listened to "Stormy Weather" more times than one should have to in any given lifetime. I still "don't know why, there's no sun up in the sky". Repetition also builds memories. 1948 was eventful in several ways. Our family bought their first new car ever, a black 2-door Chevrolet coupe. It was small, but a great car for a family of 3. Also, Dad bought me a radio! I had learned to love listening to the family radio. Grandmother Niebaum in Caldwell had an enormous wooden console model radio with a deep bass tone. We visited there often and I loved hearing her radio. One day out of the blue Dad brought home a new General Electric radio he had bought in Wellington, just for me. I remember running around Corbin trying to find friends to listen to my new radio. Few were as excited as I was. I think I recall Dad saying he had paid $20 for it. 1948 marked the first and only family vacation we ever took that wasn't to visit relatives. We went to Colorado! Another couple, the Harold Brauns, went also, but in a separate car. That was my first visit to the Garden of the Gods in Colorado Springs, a place I've visited many times since. I really find peace and beauty there. In 1994 on an early morning hike there by myself I wondered if my great grandchildren would enjoy the Garden as much as I did. It was an unusual thought for me to have and it was specifically great grandchildren. Dad spent a lot of time fishing on that trip while Mom and I explored. We did a lot of hiking. I remember walking past prison walls in Canon City. We visited Cave of the Winds and Royal Gorge. Also we explored a burned out railroad bridge on the east edge of Buena Vista. Forty years later as Judy and I were driving through Buena Vista I wondered if that old bridge was still there. It was and we drove to it just as I remembered. Two small incidents from that vacation trip remain in my memory, probably because they've been told many times over the years. Dad was a very careful driver, but Mom always told him how anyway. I don't recall Dad ever getting a traffic ticket of any kind. On our way through western Kansas Dad ran a stop sign! He just didn't see it. Mom observed that there was an officer back behind us. Dad said to me, "Don't look at him! Don't look at him! What's he doing?" We didn't get stopped, and the story has brought smiles many times. Mom was adventuresome. She wanted to drive on an old mountain road and directed us to a side road someplace in Colorado. Dad was a reluctant mountain driver, but went along with the suggestion. The gravel road narrowed to a single lane with no place to turn around. After driving some distance the road was blocked by either a tree or a rockslide, and Dad had to back the car all the way down. It was not a pleasant ending to our mountain adventure. Late in 1948 Vicki Lee Nulik was born, my first niece. Joann & Kenneth were living on a farm several miles west of Caldwell and I spent several days of my Christmas vacation with them there with my new niece. I remember holding her and singing to her an "Irish Lullaby" to put her to sleep. That was a very special visit! Mom and Dad loved to play cards, especially 5-point Pitch. About every month they were at a card party or gave a card party, often with 5 or 6 tables. At Christmas and family reunions the day would end with a game of cards. I learned to play at a very young age, taught mostly by Mom and by watching. I loved to play cards. Roger Whitten, Gary Richards, LaRue and I used to play cards often. Gary also had a snooker table in his basement, so we played pool quite a lot, too. A snooker table is bigger than a pool table and it has smaller pockets. There are lots of red balls without numbers, which must be 'made' before making the numbered balls, which count the most points. We had some great times in Gary's basement. Gary also had a really neat outdoor croquet court. One day I asked Dad if he would help me make a croquet court at our house, and he said he would. Nothing happened for quite a while, and then one day I heard a loud diesel engine just outside. Dad had driven his road grader into our yard and was making a croquet court for me! It was quite a sight as he delicately maneuvered that big beast in a very tiny space. What a fine croquet court it was, even though it lasted only a few months. It got in the way of our softball field. The Corbin Methodist Church held Bible School every summer for 2 weeks. Most every kid in the community went to that Bible School whether they went to church there or not. Roger was a Baptist and went to church in Perth, but Roger became a Methodist for 2 weeks of the summer. Often I became a Baptist for 2 weeks as well. The Bible School activities were less important than the chance to all be together. The youth were further bonded by the Methodist Youth Fellowship (MYF), which met every Sunday evening for an hour. I started singing in church choir very young. Mom sang, too, and she loved to sing. To the best of my memory Dad sang only a couple of times in my hearing, and he had a pleasant voice, but never used it. Preachers usually didn't stay long in Corbin, so there were lots of them to try to remember. Mrs. Branine had gray curly hair and a pleasant smile. Jack Thomas was from Wales and spoke with a heavy Welsh accent. He had worked in the coalmines of Wales and also had been an amateur prizefighter. How he came to be a Methodist preacher in Corbin, Kansas I'll never know! His past was also something of a mystery and he didn't talk about it much. I think he was divorced. One of his hobbies was his printing press, which he kept in the living room of the small parsonage. Each week he would print the church bulletins on his press. He once explained the whole printing process to LaRue and me in his home as he printed the Sunday bulletin. Christmas was a fun time at Corbin Grade School. The kids prepared a program every year and performed for the parents on stage on second floor. We would rehearse for weeks prior to performance. There were musical acts, readings, plays, pageants, and group singing. LaRue and I would often sing duets. Santa would come at the end of the evening and distribute presents for the gift exchange. Students drew names and bought one special gift. The teachers often gave presents as well. In 1948 Mrs. Martin gave the 4th grade boys a tiny metal hammer with a handle that unscrewed revealing a screwdriver. I still keep it in my toolbox as a very special treasure. By 4th grade Roger and I were best friends and competitors. He could run just a little bit faster, but I was his academic equal. We regularly took 1st. & 2nd. in spelling contests or ciphering contests (speed math computation on the blackboard). All of us were ready to leave Mrs. Martin and the "little" room behind us as we entered 5th grade, with a new room and a brand new teacher. Oraleen Merritt was beautiful, intelligent, kind, and gentle. She was an excellent teacher in every way, and I had the good fortune to be her student for nearly 4 years. She played the accordion and would accompany us in group singing as a regular part of our schoolwork. Academically, she inspired us to want to do our best. In 5th grade Roger and I made up a map game. The two of us would go to the wall maps and try to find an obscure town name to challenge the other to find. It was a great way to learn geography, plus it instilled in me a lifelong love of maps. Sometime in 1949 or 1950 LaRue and I visited Aunt Ethel Choice in El Reno, Oklahoma. More than once I remember taking the train from Corbin to El Reno. Train travel was an exciting experience. Whenever another train was beside us at a stop and one train started to move there was a certain mystery about whether it was your train or the other that was moving. Aunt Ethel had a television set and so did her son, Rua, mentioned earlier. By then channel 4, WKY-TV in Oklahoma City, was broadcasting regularly. Shows I recall watching then were Topper, the Betty White Show (Life with Elizabeth), and Sleepwalkers Matinee, a late night movie that started at 10:30. I was hooked on television! 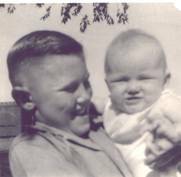 My second niece, Sheryl Lyn, was born in December 1950. In the summer of 1951 we took a trip from Corbin to Eudora, Kansas shortly after the great flood of '51. From Lawrence to Eudora there was nearly unbroken water on both sides of old highway 10 all the way to the Kansas River. The farmhouses were like little islands. It was a spectacular and memorable sight. We visited Mom's niece, Bertie Morris, and her husband, Merl in Eudora. We also spent some time with some of Dad's relatives on a farm north of Tonganoxie. They had a television set! There I was introduced to Howdy Doody for the first time. The only channel in the area was WDAF-TV, channel 4 in Kansas City, Missouri. Kansas did not yet have its first TV station, but I was determined to get a TV set of my own! The summer of '51 was my last 'free' summer. Dad still had some faint hope of farming again, at least at some level, so he bought an old John Deere D tractor and an old 3-bottom plow. Sometime that year he did some custom plowing for farmers in the community and taught me how to drive it. The John Deere D was a real workhorse. With only 2 cylinders it was terribly noisy! It could only be started by spinning an enormous flywheel on the left side of the engine. It took a pretty strong arm to start the beast, and I was much too weak to spin the wheel. In the summer of '52 Dad was working for the Santa Fe railroad in Wellington. He had sold his interest in the Corbin garage by then and never returned to being a mechanic. Dad arranged for me to work at the Sam P. Wallingford grain elevator at the north edge of Corbin. I helped unload wheat trucks by running the lift to raise the front of the trucks to allow the wheat to run out into a pit where it was augured into storage bins, or into railroad boxcars. My second responsibility was to pull the boxcars into position with my John Deere tractor. It was hot, hard, tiring work with a lot of responsibility for a 12 year old. Workdays could last 12 hours on dry days when the wheat harvest went until nightfall. It was the first and only time I worked at the elevator. Two incidents could have been serious to my health and well being, but they were not. One day I was walking in a part of the elevator near the pit to get a grease gun hanging on a ladder. The ladder led down the pit some 15 feet below. Someone had left the trap door to the pit open and as I reached for the grease gun I stepped off into nothingness! As I fell, I grabbed the rungs of the ladder and hung on for life and limb. Nothing injured but my pride. The second incident could have been disastrous for a fellow worker at another elevator nearby. To pull the boxcars away from the elevator involved hooking a log chain on the side of the wheels of the boxcar and pulling it with the tractor. A loaded boxcar is incredibly heavy! In fact it is heavy enough to flatten a Lincoln penny to the size of a quarter, which we did with some regularity. It took 2 of us to move a car, me on the tractor and a brakeman on the top to operate the brakes. One day we were trying to move an especially stubborn car and I caused it to move faster than it should. Unfortunately the brakes didn't work properly and it picked up speed on a slight decline. We threw down 2x4 wood pieces in front of the wheels to try to stop it, but it sliced them like a hot knife through butter. Eventually it struck the box cars parked at the neighboring elevator knocking one of the workers from a tall ladder. He was injured enough to see a doctor, but they were neither lasting nor serious. The accident forced them out of business for half a day at a very busy time. I felt awful! In all, I worked at the elevator for 12 days and didn't even know what my wages were to be. I was paid $20 per day for that job for a total income of $240. My fuel expenses for the tractor were $40, so my net earnings were $200. I was rich! My fellow workers were paid only $8 per day, but then they didn't have a tractor. Immediately after that, Dad got me a custom plowing job of 80 acres for Corky Corzine southeast of Corbin. My days started in the field by 6:00 a.m. and I worked until about 8:00 p.m. Mom packed me lunches and Dad delivered me to the field before he went to work in Wellington. Since I wasn't yet strong enough to start the tractor, Dad would start it and we let in run all day long. My driving motivation in those days was to buy a television set! I was to be paid $2.50 per acre for my effort. In 4 days I was completely finished with the field and collected by check for $200. My fuel expenses were again $40, so my net was $160 or an average of $40 per day, a remarkable amount for those days and times. After more than 40 years I still remember a lot of the details of that experience and the thrill of knowing I had earned enough to buy a TV set. In July 1952, Dad and I drove to Bluff City, Ks. (west of Corbin) to buy a television set from Sam Croft. Sam was a farmer/entrepreneur of some repute (ill and otherwise) who sold television sets in a large steel implement building in Bluff City. We picked out a 17-inch Admiral set for $150 and arranged for installation of a tall antenna for another $100. The antenna was about 30 ft. tall and mounted in a casing so that the whole antenna could be rotated for best reception. It was also hinged so that the entire thing could be lowered for repairs. In August of '52 we got our first reception from WKY-TV in Oklahoma City. In those days there was no or little daytime television. Among the first shows we watched were the national political conventions of '52. Later, in November, Dwight Eishenhower and Richard Nixon were elected President and Vice-President. After Dad moved to the Leisure Center nursing home in Caldwell in 1989 I met again and became reacquainted with Sam Croft, who was a resident there. Sam was confined to a wheelchair, but had a marvelous sense of humor. He would stop Judy and me whenever he saw us come in, and regale us with some new story. I related the TV purchase story to him and he seemed to recall having been in the television business. Although Dad had been a baseball pitcher as a kid we only played baseball together one time that I remember, partly because I only remember playing one baseball game ever! Though I dearly loved playing softball, the baseball was too small and too hard. Besides, hardly anyone in Corbin played baseball except Gary Richards. Gary's dad, Porter, was the local bank owner/president. One year he sponsored a team in Caldwell on which Gary played. For our end of school year activity he organized a father/son baseball game. The fathers played against the sons as I recall. One play of the game, which is still vivid in my mind, involved my Dad. He had gotten on second base with a nice hit to the field. Gary Richards, playing shortstop, took the relay from the fielder and held Dad at second. He then pretended to return the ball to the pitcher to resume play. Dad, thinking the pitcher now had the ball, took his lead off second base, and Gary tagged him out. I remember being astonished at the play, but also having some sympathy for Dad, who had been tricked. That trick was unknown to softball players, who cannot leave the base as in baseball. Shortly after that, the bank examiners discovered that Porter Richards kept two sets of books at the bank and had been embezzling money for about 10 years to a total of $39,000. The town was devastated! Because Joann had worked at the bank she was called to testify at the trial, but had no knowledge of any of it. I feared my savings account of $13 was wiped out, but I got $9 back immediately and the other $4 sometime later, just as all other account holders. Porter was sentenced to prison for a few years, and the Richards family moved to Mulvane. I felt very very sad for Gary and his family. It was an awfully tough time for him. The Corbin Bank never re-opened and its demise was a fatal blow to the Corbin business community. 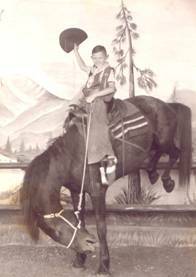 By seventh grade Roger Whitten and his family had moved to Wichita. Roger and I were best friends through grade school and even now we visit occasionally. He was bright and constantly challenged me to keep up with him academically and athletically. We were together constantly, and shared a lot of laughs and good times. By eighth grade Roger was gone, Gary was gone, and then my teacher resigned to get married. My childhood world was crumbling. Oraleen Merritt was my teacher, my mentor, and my friend for 3.5 years, and then she left me for an older man. Irvin Urban was in the service and when he returned at Christmas, Oraleen retired and they were married. She had been an excellent teacher and motivator. They moved to a farm across the road up by the river from the Richard Johnson farm, which I came to know in a few short years. The winter/spring of '52-'53 were filled with television and eighth grade in roughly that order of importance. Sometime in grade school LaRue and I decided that Marilyn Wilson was my girl friend, and I think Marilyn had decided that, too. We spent a lot of time playing at the Wilson house on the west edge of town near the railroad tracks. We played cards, board games, and on warm evenings we played "dare" outside under the cedar trees. Usually it was Marilyn and Carolyn (the twins), LaRue, and me. One of the group would dare the other to do something, like sing a song or something silly. Inevitably, it involved kissing. My third niece, Shelley Ann, was born in January 1953. By eighth grade I had a new girl friend, Carolyn Ginn. Carolyn's brothers, Gary and David, were ball-playing friends and the family was Methodist. We were also all in a 4-H club together, the Skylark Club. Carolyn and I square danced together and were actors in a play presented at the 4-H Fair in Wellington. We held hands during church, but thought that we weren't supposed to, so we each put an arm behind our backs and held hands in 'secret'. Perhaps the strangest event that year was a slumber party at our house planned by LaRue and me with the Wilson twins, Carolyn Ginn, and the two of us. Mom was a great sport and called the mothers, Bess Ginn and Laveta Wilson, to assure them the invitation was legitimate and parent-sanctioned. Indeed we had an all night, totally innocent fun slumber party. LaRue and I slept in my bedroom and all 3 girls slept in the guest bed. That experience certainly made me more tolerant of slumber party requests from Richard and Jerri as they grew up, though they may disagree on my level of tolerance. Carolyn and I had some fun times together, but alas she left me for another in high school. I was heart-broken for a few weeks, but then discovered there were a lot more girls in Caldwell High School than ever there were in Corbin Grade School. At Halloween in 1952 Alan Kubik from Caldwell invited me to a costume party. The Kubiks had been family friends and Alan and I enjoyed each other a lot. At my request, Mom told him I couldn't come, but my plan was to go disguised. Just as I planned, no one at the party could figure out who I was. Actually, hardly anyone there knew me anyway. The party involved some games in the dark in an old barn behind the Kubik home in Caldwell. At some point in the evening I was climbing a ladder to the loft when someone accidentally kicked a hammer into the opening and it struck me on the head. They took me to the kitchen and I still remember Alan's great surprise and delight when I removed my mask. I did have a bad headache and big knot for the rest of the party, but the thrill of the surprise made it all worthwhile. That incident was recorded in our class history the following way: "Alan Kubik gave a Halloween party this year in his barn. After everyone arrived, we guessed who was who. The only character no one knew was a little old lady who turned out to be a complete stranger, Alan's friend, Jerome Niebaum. During the course of the evening, someone hit Jerome with a hammer and knocked him out. I wonder what his first impression of us was?"